Dates and times: 1st to 9th December 2018. Cornerstone is open from 10am – 6pm Tuesdays to Saturdays and 11am – 4pm on Sundays. 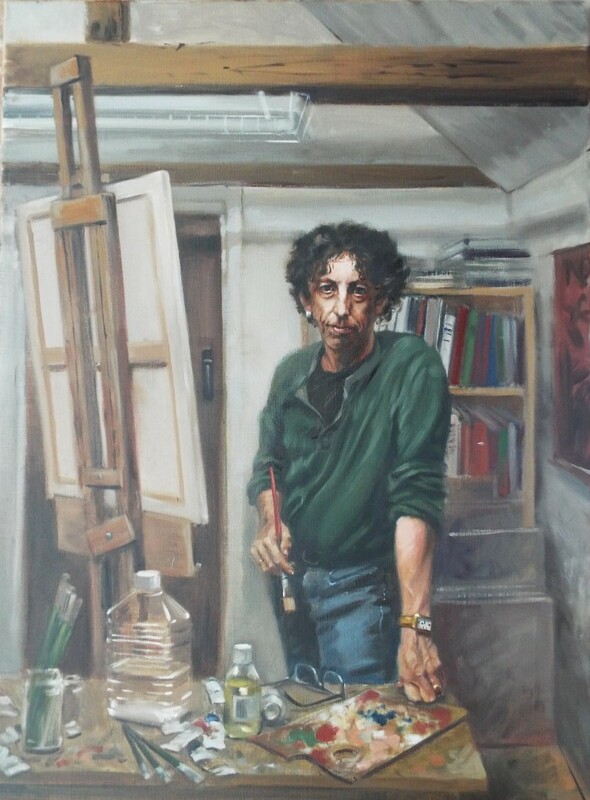 A collection of oil paintings that consider the relationship between people and their place of work.This is a celebration of the skill of the sitter where a single concentrated look can sum up a lifetime’s knowledge and experience.The lighting that illuminates their work also gives focus to the composition. Whether the spaces are cluttered, tidy, pretty or purely practical, the moods and atmospheres that they create are integral to the piece. These works are as much a portrait of the space as they are of the sitter. The exhibition depicts gatherings and groups of people be they biker meetings; folk festivals; carnivals or cafe scenes. Shown along side this are more subtle portraits of friends and local characters. From Harley Davidsons to Morris dancers this is an exhibition that celebrates life! As part of Oxfordshire Atrweeks Festival 2015 I shall be showing recent portraits and Oxfordshire scenes along side six other artists in this beautiful space. Times: Saturdays 12.00pm to 7.00pm; Sundays 12.00pm to 6.00pm; week days 12.00 to 9.00pm except Wednesdays 5.00pm to 9.00pm. 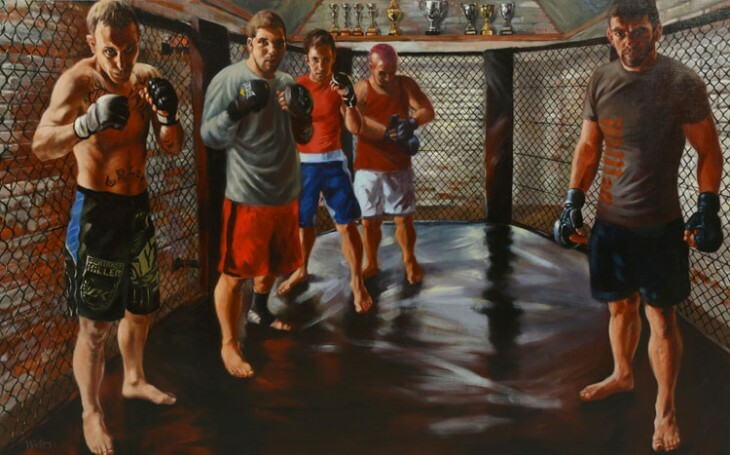 Based around the sport of Mixed Martial Arts or “Cage Fighting this is an adrenalin rush of a show that depicts fighters in training and competition. Complementing this are more reflective portraits and figure studies. Whether you are a sports fan or just enjoy powerful imagery that celebrates the human form this is one not to be missed. I was interviewed by Gill Oliver about my Noble Art exhibition at the South Moreton Boxing Club. Read the interview here (opens as a pdf file). 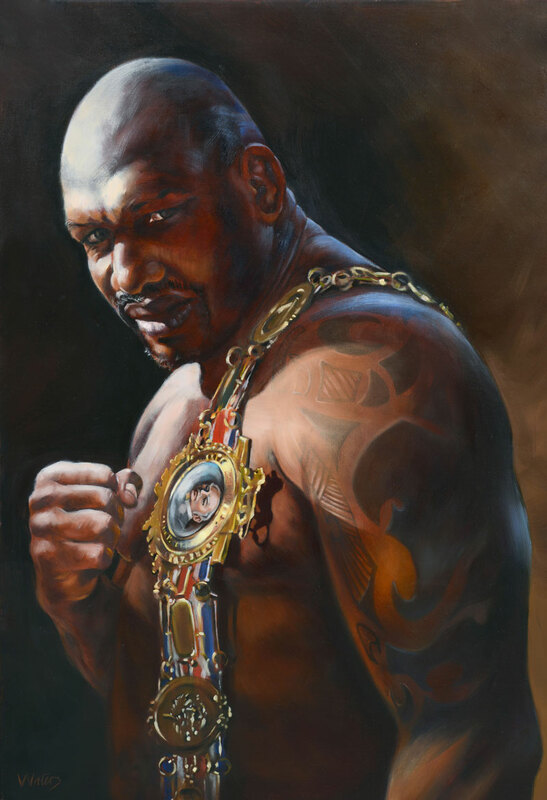 This is what I have been inspired to paint whilst attending South Moreton Boxing club during the last year. I have encountered some real characters and hope that I have done them justice. There is so much more that I wish to do. Look out for next years exhibition ‘Welcome to the Cage’. The exhibition is dedicated to my late Uncle Terry who was a successful amateur boxer.